It's been 22 and 21 years, respectively, since we said goodbye to Tupac Shakur and Notorious B.I.G., and one question that seems to keep coming up is how old Tupac and Biggie would be today. Tupac was born on June 16, 1971, which means he would have turned 47 this year. 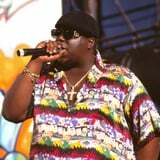 Biggie, on the other hand, was born a year later on May 21, 1972, and would have celebrated his 46th birthday. Sadly, both Tupac and Biggie's lives were cut short when they were fatally shot on Sept. 13, 1996, and March 9, 1997, respectively. However, their legacy will forever live on in the history of hip-hop.